When done well, genealogy involves using primary documents to connect each generation in a family tree. Ideally, these documents will provide information such as full name, age, names of immediate relatives, location, religion, and occupation—details that together help prove an individual’s identity and their place within the tree. However, genealogists and family historians can run into numerous obstacles when trying to obtain the necessary primary documents. These obstacles arise from two main sources: gaps in the historical record, and legal restrictions preventing access to documents that are more recent. These issues are amplified for researchers of Indigenous family history, further complicating what can already be a difficult process, and perpetuating colonial systems of administration and its definitions of ethnicity. 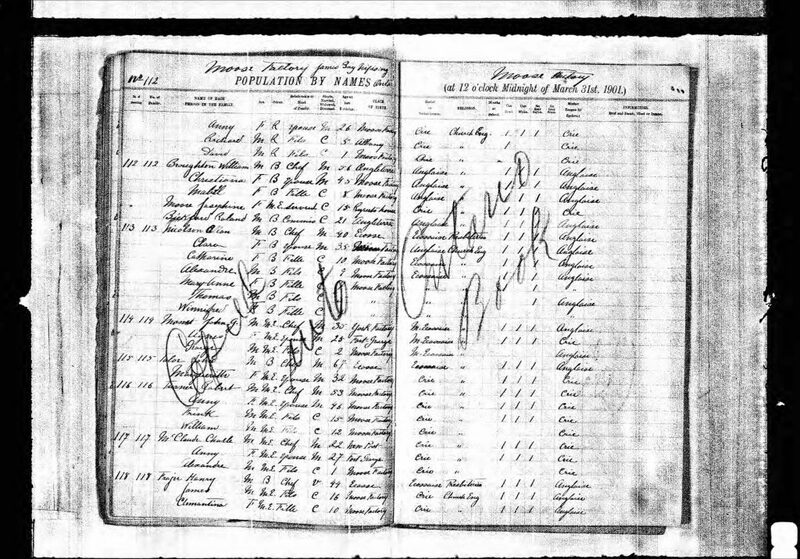 Census records and church registers are common genealogical sources because they typically provide a high level of detail. Age, location, occupation, names of relatives, language, and religion can all be used to confirm relationships and add to a family’s story. With regards to Indigenous populations, these sources are not always reliable; settler-centric in both design and execution, these colonial forms of record-keeping were not designed to accommodate Indigenous traditions or ways of life, often resulting in ignorance and erasure in the historical record. Census schedules and instructions to enumerators, for example, changed from census to census. In her article “‘Anyone not on the list might as well be dead’: Aboriginal Peoples and the Censuses of Canada, 1851– 1916,” Michelle Hamilton describes the significant impact of design and methodology on census results, noting how methods of recording ethnicity were especially inconsistent. 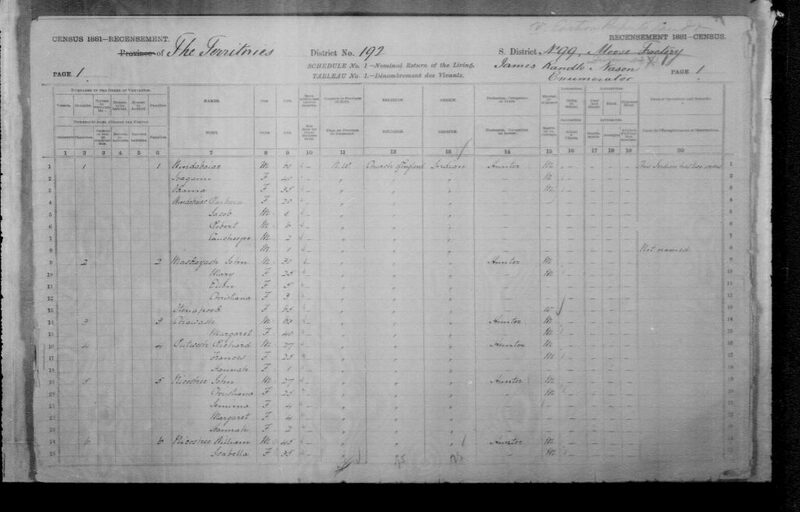 The 1871 and 1881 Census of Canada used an “Origin” column, and instructions to enumerators were to fill this “as given by the person questioned…by the words English, Irish, Scotch, African, Indian, German, French, and so forth.” In 1891, the Origin column disappeared and was replaced by a “French Canadian” column, which could be ticked or left blank. In 1901, the ethnic indicator was again changed, this time with a column for “Racial or Tribal Origin.” This recorded paternal ethnicity for white families; specific tribes for some First Nations populations; and designated Métis, commonly known as “halfbreeds” at the time, as “French Breed,” “Scotch Breed,” “English Breed,” and so forth. These inconsistencies meant that a single family could easily be recorded as French, Indian, French Canadian, and Chippewa French Breed across different census records, making it difficult to determine an individual or family’s “true” ethnicity and complicating how genealogists typically identify ancestors. For Indigenous populations in remote areas, historic census records relied heavily on the Department of Indian Affairs and local missionaries (“The Aboriginal Population and the 1891 Census of Canada,” Michelle Hamilton and Kris Inwood, in Indigenous Peoples and Demography: The Complex Relation between Identity and Statistics, p. 100). This means that records relating to Indigenous peoples only exist post-contact with individual groups, i.e. the advent of settlement, colonial administration, or the arrival of missionaries. Even after contact, information contained in these records is often unreliable due to language barriers, reluctance to provide information, and mobility patterns. Indigenous names were also inconsistently recorded, sometimes as traditional but misspelled names, and often under European aliases. Where records do exist, they can be difficult to identify. On Ancestry.ca, the 1881 Census for Moose Factory is found under Northwest Territories > Eastern Rupert’s Land. In 1901, Moose Factory is under Quebec > Pontiac > “Not Stated.” Looking further north, documents become even more scarce. The Inuit, for example, were not even counted in the federal census until after 1941. Determining where a historic individual may have been located also depends on the mobility and territorial scope of Indigenous populations, and of record keepers. Church records are also affected by this, as itinerant missionaries travelled to remote areas to perform services but did not necessarily record which community they were in at a given time, nor where people may have travelled from to receive them. Such issues not only omit key information, but can also erase the presence or identities of historic Indigenous populations and individuals. In addition to issues in the historical record, a number of contemporary obstacles hinder Indigenous genealogical research, perhaps the most significant being access restrictions and privacy laws for records created within the past hundred years. Public access to federal census records is restricted under the Statistics Act, preventing third-party access until 92 years after the census was taken, at which point the census is transferred to the national archives. Vital statistics—birth, marriage, and death records— fall under provincial jurisdiction. On average, access is restricted between 70 and 100 years after the event was recorded. Unless requested by the individual to whom records pertain, or by their immediate heirs if the person is deceased, it is virtually impossible to access recent federal and provincial records. Though access via family members is sometimes an option, circumstances such as adoption or unwillingness of a relative to share information may be a further obstacle. Access to church records varies depending on the church. The Catholic Archdiocese of Toronto, for example, prohibits access to original parish registers. 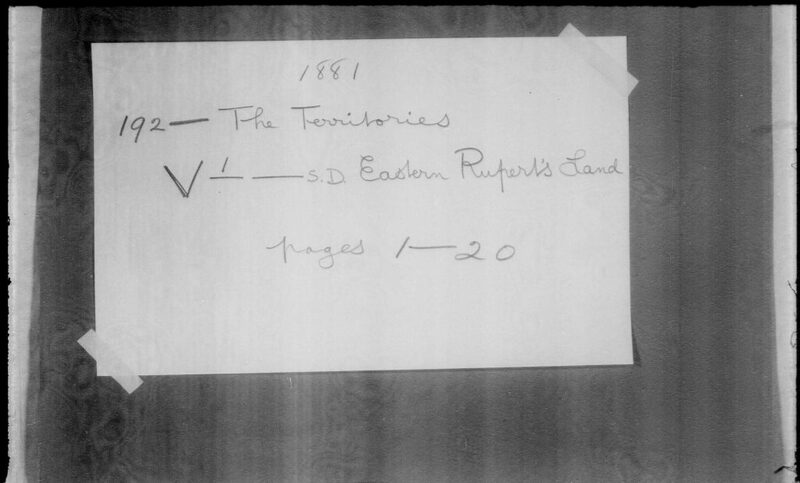 Pre-1910 registers have been microfilmed by the Mormon Church, with some digitized on FamilySearch.org, whereas later registers must be assessed by the Archdiocese. Department of Indian Affairs records at Library and Archives Canada can be a valuable resource for genealogists, as personal and familial information appears in documents like treaty pay lists, correspondence files, and band records. These sources too are subject to privacy restrictions where files contain personal information on individuals who may still be living. Many files would thus require not just an ATIP request, but also a Band Council Resolution from the band to which records are related. Bypassing access restrictions can be a lengthy and costly process for researchers, with no guarantee that access will be granted or yield results. Genealogical records for Indigenous populations are prone to inconsistencies and omissions. They can be difficult to access both for recent and early generations, and they rely on inherently colonial systems of documentation, archiving, and access. Such issues have a direct impact on indigenous families who want to access their family history. Depending on the location and time period involved, it may be nearly impossible to locate and obtain primary documents that accurately connect each generation in a family tree. An understanding of these challenges is crucial for decision makers who rely on genealogical evidence. When genealogy is needed to access Indigenous rights, the requirements that are set for genealogical evidence can have a profound effect on who is able to access these rights. No universal standards exist for genealogy, and requirements for burden of proof can be vastly different depending on who is doing the research and for what purpose. More specifically, there are no Indigenously-developed standards for genealogy that take these unique challenges into account and make space for alternatives to colonial documents, such as oral histories and traditional knowledge. The reality of Indigenous genealogy can be much more challenging than current marketing campaigns let on; however, despite these challenges, Indigenous genealogy is vitally important to families and their wider communities. Amateur and professional genealogists, family historians, consultants, and policy makers, aided by an understanding of these challenges, now have an opportunity—and indeed an obligation— to shift the focus of the historic record away from colonial administration and back to the people behind the pages. Stacey Devlin is an Associate at Know History, a historical consulting firm in Ottawa, Ontario. Her current and past projects have included Metis genealogy, GIS mapping, and social network analysis. She holds an M.A. in Public History from Western University. Emily Cuggy is an Associate at Know History, where she has worked on a variety of projects and gained significant experience conducting Metis genealogical research. Emily holds an M.A. in Public History from Carleton University. Axelsson, Per, and Peter Sköld, ed. Indigenous Peoples and Demography: The Complex Relation between Identity and Statistics. New York: Berghahn Books, 2011. Chute, Janet E. The Legacy of Shingwaukonse: A Century of Native Leadership. Toronto: University of Toronto Press, 1998. Hamilton, Michelle. “‘Anyone not on the list might as well be dead’: Aboriginal Peoples and the Censuses of Canada,1851–1916.” Journal of the Canadian Historical Association 18, no. 4 (2007): 57-79. Nickeron, Janice. “Researching Aboriginal Ancestors in Ontario.” Family Chronicle (September/October 2009): 37-41. http://www.tbpl.ca/upload/documents/researching–aboriginal–ancesters–in–ontario–by–janice–nickerson.pdf. “Do you have Aboriginal ancestry? The census might tell you.” Library and Archives Canada Blog. October 5, 2016. https://thediscoverblog.com/2016/10/05/do–you–have–aboriginal–ancestry–the–census–might–tell–you/. Thanks for this post! Very interesting and timely. I wanted to share another couple of resources for people who are interested in this topic too. Chris Andersen’s book “Métis”: Race, Recognition, and the Struggle for Indigenous Peoplehood (https://www.ubcpress.ca/metis) is an incredible resource that discusses the census in relation to Métis identity to a great level of detail. He highlights similar trends to those you mention about the changing of identity categories that the census asks about over time. Also, I think that Darryl Leroux and Adam Gaudry’s research about how genealogical research is being used by settlers who find one Indigenous ancestor in their family tree to make claims to Indigeneity is important reading (https://twitter.com/i/moments/938009467173601282; https://soundcloud.com/indigenousstudiesusask/native-studies-speakers-series-darryl-leroux-now-i-am-metis-how-white-people-become-indigenous; https://www.academia.edu/33742034/White_Settler_Revisionism_and_Making_M%C3%A9tis_Everywhere?auto=download). It falls beyond the scope of your post since as you mention in your footnote you’re not getting into the use of these records but some readers may want to find out more about this. It seems to me the DNA tests and related controversies are getting more discussion in the press than genealogical research in archives. I wanted to clarify in your article that genealogical information can be obtained through Indigenous and Northern Affairs Canada without an ATIP request or a BCR if one is requesting information on a direct ancestor (parent, grandparent, etc.) or any individual that has been dead longer than 20 years. Contact INAC’s Public Enquiries Contact Centre for more information.